Time and time again I am asked by my community can they begin to transform their lives using the law of attraction and manifestation. While the simple answer is YES, there is more to it than just simply making the intention of change and are often shocked when they hear how they can do it. Many people think it is something that require minimal effort and little change. I’m sorry to say that to transform your life you must be prepared to take positive action, be consistent and allow change. Firstly we need to understand that manifestation is the action of our thoughts, emotions and dreams coming into our reality. This is often confused with The Law of Attraction (LOA), when it is in fact, the result of the Law of Attraction. The LOA states that each thought, word, emotion and action has an energy value, which in turn attracts an equal energy. Let me ask you this: how many times do you think “what else could possibly go wrong?” then wonder why something else heads your way that is negative? And how many times have you felt positive in life and had an influx of happy events come your way that you haven’t been able to explain? Like attracts like and where your attention goes your energy flows. This means that when you think negatively you attract more negativity because your attention has been focused on what is going wrong. Equally, when you focus on the positive in your life you attract more of the same. 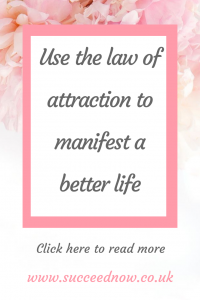 How can you use The Law of Attraction to manifest a better life? So now you understand the basic principles behind creating a better life for yourself using the universal Law of Attraction you can begin to take action on change. Let’s look at some simple steps you can begin to implement right now. Begin your day by visualising a perfect day where all goes according to plan. That may be a good day at work, a profitable day in your business. The children behaving, good news, an easy commute, bumping into old friends and so on. When you begin your day in positivity you raise your vibration/energy. Remembering like attracts like, you will attract more positive events into your life. However to truly active the power of your morning routine you must feel the emotions of the happiness, success and love you visualise. It’s time to rewire your brain! Your brain is like a super computer and sends out the energy that’s is being processed. So your negative thoughts are transmitted to the universe which send back reasons to remain in a negative state of reality. However when we include affirmations into our life we reprogram the brain to transmit positivity calling more back from the universe. If you have never practised the art of affirmation it can feel odd at first. But trust me it has a profound effect on your reality in the longer term. An affirmation is a positive statement based in the present tense that you will write, say or both daily, and ideally immediately after your visualisation. It is important to point out that your affirmation need to be in the present tense (as if it already happened) and be focusing on the positivity you wish to be/have and not what you want to change. For example “I AM GRATEFUL FOR THE ABUNDANCE OF MONEY I HAVE” rather than “I AM DEBT FREE”. 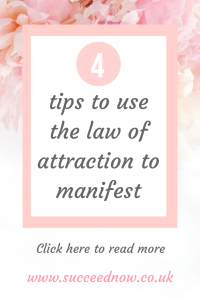 For help in creating your new affirmations you can download my free guide by clicking here and it will be sent straight to your Facebook messenger inbox. Ok, so your life isn’t where you want it to be but you still have so much abundance already and for that you must give gratitude. 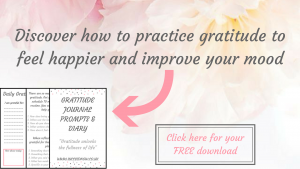 Perhaps you have heard the term “attitude of gratitude” and thought it was just mumbo jumbo. Let me tell you, it certainly is far from mumbo jumbo. In fact it is a crucial element in manifesting a better life. When you are grateful for what you already have you transmit the energy to call in more reasons to be grateful (remember like attracts like). On the flipside, when we focus on what we don’t yet have we are in a place of lack and transmit the energy of wanting more lack. It doesn’t matter how good your morning routine is, how amazing your affirmation is or how much you are grateful you are IF YOU DON’T TAKE ACTION AND CHANGE!!! Doing the same things day in day out that have you stuck in a life you want to change wont move your forward to the life you want. It’s time to try new things. To step out of your comfort zone and accept that you and your life will have to change. Start small and as you grow in confidence then make bolder changes and take braver action. Now that you have a better understanding of what manifesting a better life is and how you can begin the process, there is one final key ingredient that holds everything together: consistency! Sure you might have a few good days here and there but without being consistent in your action and mindset you will not see the transformation you crave. You and only you can choose to make the decision to change and grow. You and only you are responsible for your action or lack of it. In case you need just one final note of encouragement I shall leave you to journal the following. Come back to the comments and share your thoughts and lightbulb moments. Which option will you be choosing and why? 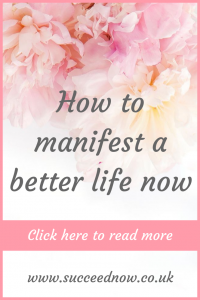 What are my first steps on this new journey to manifesting a better life? I truly look forward to reading your comments, cheering you on and answering any of your questions. Chelle is a spiritual transformation queen helping women find their inner magic and live a life that is aligned with their purpose enabling them to be, do and have anything they desire. Helping women connect to their purpose. Invite more success and happiness into their life and ditch their limiting beliefs to completely transform their reality. Chelle is a single mum of three, #1 best selling author and is accredited in a range of techniques for body mind and spirit.